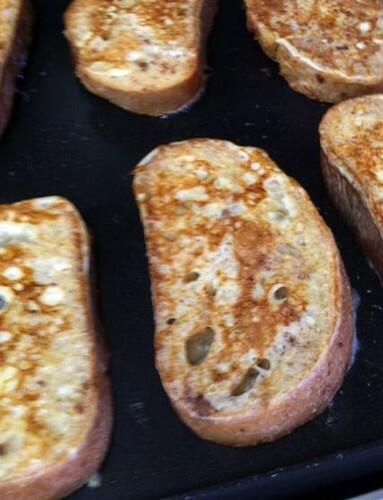 My family never made French toast for breakfast when I was growing up. We had pancakes or biscuits instead. I am definitely a product of my childhood so I’ve never made French Toast as an adult either. When Nana suggested we have it for Easter breakfast, I was game but I had no idea how to make it. She couldn’t find her “go to” recipe so to Google we ran. This recipe looked easy peasey and it tasted awesome. Beat eggs and mix in milk, cinnamon and sugar. Pour mixture in a shallow bowl. Preheat a nonstick griddle or skillet and grease with butter. Dip each piece of bread into the egg mixture letting it soak up a bit of the mixture. Fry each piece on the griddle until browned. Flip and brown other side. Serve with butter and your favorite syrup.